It's been warm enough during the days for foragers to forage, but still too cold at night to confidently put syrup inside hives. The compromise is open feeding, and I'm doing the job with these Bee Smart "Ultimate Hive Feeders." I like the Bee Smart feeders better than a typical bucket feeder for this purpose because they can deliver far more food in a short time. 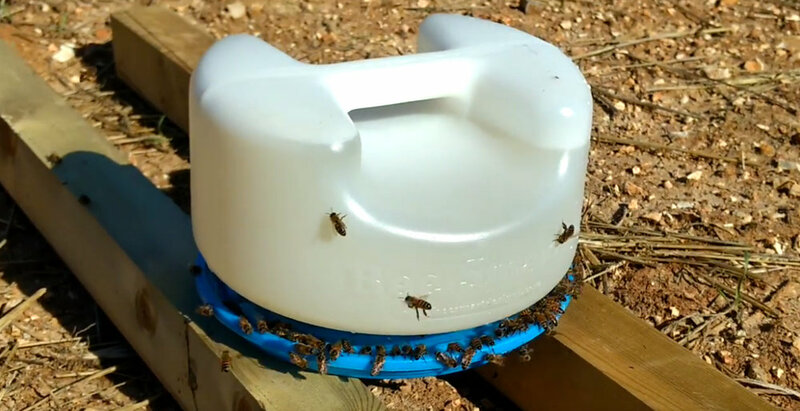 Rather than having to take turns drinking from a dozen holes poked in the lid of an inverted bucket feeder, hundreds of bees line up around the rim and fill up as fast as new bees can arrive. Also, setting it out in the sun helps keep the syrup from chilling the bees, and there's no danger of wild temperature swings inducing uncontrolled leaks over the cluster. Open feeding has its critics, who often claim it creates "lazy" bees (which is nuts) or that it induces robbing. On the contrary, by feeding this way I'm giving workers in my strong and weak colonies food to gather outside the bee yard. Without this productive distraction, I suspect stronger colonies would be much more fierce in their robbing efforts, and weaker colonies would be hard-pressed to build up fast enough to fend off the attackers.